Why Build a Nose on a Forehead? The case of a man undergoing nasal reconstruction is being called global medical progress. I was flipping through the overnight syndicated news images from the AP and Reuters this morning, and this one caught my eye. Probably because the man in the photo does not have a "typical human face." It's an interesting story. 22-year-old Xiaolian, of China's Fujian province, injured his nose in a car accident last year, and he didn't get treatment. A subsequent infection ate away the cartilage of his nose. It kept getting worse, and when he did get medical attention, doctors decided he needed a whole new nose. You can't just buy a nose at the store these days, though. (Thanks, Obamacare?) 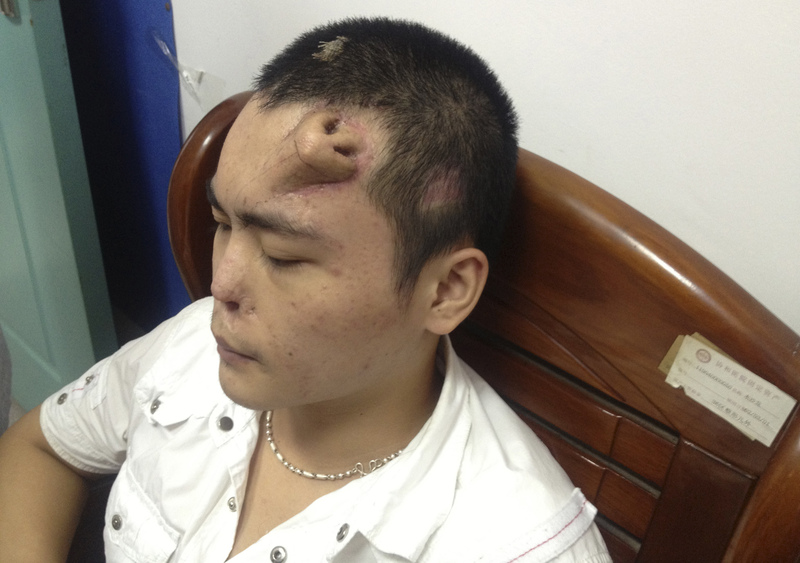 So Chinese surgeons "grew" this "nose" on Xiaolian's forehead purposely. The new nose is only there temporarily, until it's ready to be transplanted to middle of his face. The surgeons constructed it months ago, after first harvesting some cartilage from between Xiaolian's ribs. They then stretched out the skin on his forehead, and built that skin and cartilage to resemble a human nose. New capillaries grew and incorporated the nose as part of Xiaolian's face. The photo, taken earlier this week, is in preparation for the transplant surgery, which surgeons say will happen soon. Why did they build the nose in such a conspicuous place? Couldn't they have put it on his forearm, or shoulder, or ... anywhere else? Well, even though this isn't a procedure that's done in the U.S., I know plastic surgeons typically prefer forehead skin for nose reconstruction, just because it's the most similar to the skin on the nose. Also, the surgeons should be able to keep some of the blood supply going throughout the transplant procedure—basically swinging it down into place around an axis of attachment in the low-middle forehead—which is better than having to completely disconnect the nose, and risking that the blood supply doesn't take hold. Even if this procedure doesn't catch on, its success would be an interesting proof of concept. And as to, "does it 'work'"? Where it is now, for olfaction, no. As a conversation starter, yes.